Trailer - Kleptomaniac Who's Really Robbing God Anyway? Frank Chase, Jr. was born in 1959. He is the son of Frank Chase and Romaine Berry. He grew up in Baltimore Md. and graduated from Walbrook High School in 1978. After high school, Frank spent four years in the United States Army and during that time became a follower of the Messiah. After completing his tour of duty, he attended Washington State University (WSU) and graduated in 1989 with a Bachelor’s degree in Communications and a minor in Sociology. Because Frank believes in education, he pursued religious degrees and graduated from North Carolina College of Theology with a Bachelor of Biblical Studies, a Master of Arts in Theology, and a Doctor of Theology. Anyone who knows Frank will tell you that he has always been an analytical thinker about every aspect of life even from childhood. Frank seeks to start a conversation about mandatory tithe doctrines that make promises and guarantees of health and wealth, but never deliver. Frank Chase Jr. has been married for 19 years to Teresa Chase. He is a proud father of six children, Jeremiah, Nathanial, Roketta, Amanda, Emmanuel, and Sara. He has five grandsons, Xavier, Josiah, Aleksey, Jayden and Eli. In his professional career, Frank writes preventive maintenance articles for Army aircraft for the Department of the Army. He is an avid racquetball player, and loves movies, reading and good conversation, and he never shies away from talking about difficult or even controversial subjects. 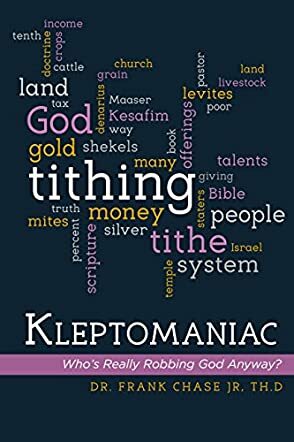 Kleptomaniac: Who’s Really Robbing God Anyway? may have more biblical quotes and references to tithing and money in general than any book I have ever read, save, of course, the Bible itself. It is written in a very smooth and articulate style that I’m guessing will be understandable to most people, but at the same time Dr. Frank Chase Jr’s education and vocabulary are evident on every page. As is his faith and his desire to help. From Abraham to Paul, Frank Chase Jr. delves into the origin, the definition, the application, and even the abuse of the custom of tithing. It is an interesting and sometimes colorful history and one Christians should certainly be more aware of. This book will help them.